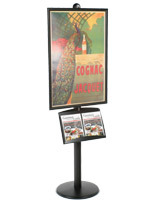 If you are looking for a display stand for a trade show or venue with large crowds, then this FORTE poster display stand is what you need. 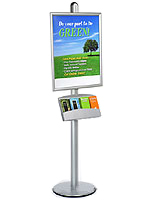 Towering over most other poster displays, the pole stands 73" tall. 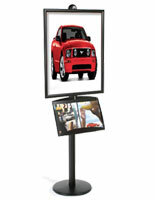 What a way to attract attention to your exhibit! 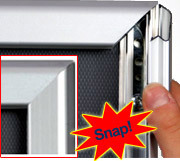 The snap frame attaches to the pole with ease and allows you quick graphic changes. Simply snap open the sides, place your 22"x28" poster inside, lay the plastic lens over it (included), and snap the sides closed. 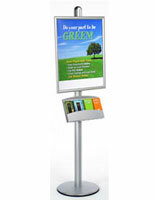 The poster display stand also features a steel literature tray for your promotional materials. 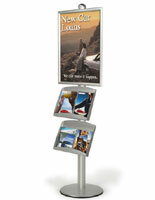 Like the snap frame, the literature holder attaches to the pole and is fairly easy to adjust to the height you want. 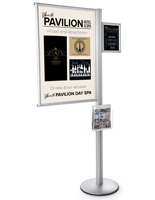 The trays hold 2 standard 8.5" x 11" brochures side by side or one extra wide magazine or other literature. 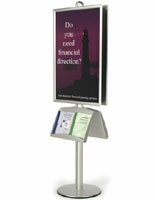 Made from powder coated steel, the literature holders are solid, durable, and resistant to paint chipping or scratching. 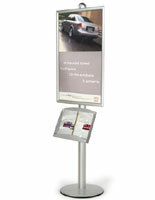 In all, this FORTE poster display stand is a steadfast unit that will not falter or topple over. 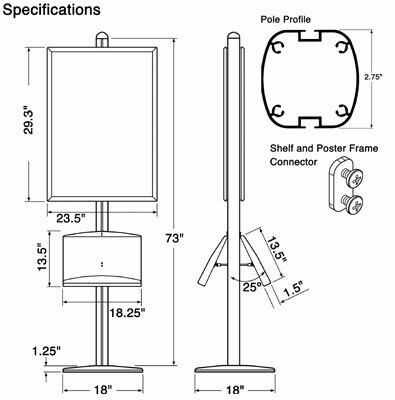 The pole and base alone weigh 25 lbs, making the foundation for the display extremely sturdy. When intentionally moved, the base will not cause damage to the floor due to its rubber lining. Install accessories from the bottom up. For this display the literature shelf would be installed first. slide the literature shelf down to the desired height and then tighten the screws. Post dented and the large bolt that holds the base weight on never arrived. Really, I paid over $45 in shipping so I can have a dented product and missing pieces. We're so sorry to hear about the trouble with your order, Warren. A customer care specialist will be reaching out shortly to assist. We certainly don't want you to have to settle for a damaged product. This is a great sign and would be perfect if we were to set it up and leave it but it is a bit awkward if you need to move it around. Otherwise, it does it's job well! Thanks for sending us your feedback, Christine! We're always looking for ways to improve our products so we value our customers' input. I have used these stands before. They are sharp, sturdy, and hold up well. We're thrilled to hear all of your great feedback, Drew! We hope to work with you again soon.